Both projects are easy to make. They both use a length of "2 x 12" construction lumber for the body. The reindeer sports a "Christmas hat" that you can remove after the holidays. 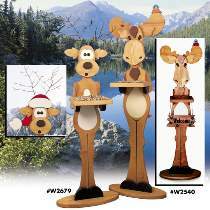 Both projects hold a bird feeder tray and/or a hanging sign on which you can display either a "Welcome" or a "Wipe Your Hoofs" decal. Plans are drawn FULL SIZE. Both projects use one pair of brown eyes. Moose also uses one pair of amber eyes for bluebird. Order eyes and decals below.